Background Older people confined to their own homes due to frailty, multiple longterm conditions and/or complex needs, are known to be at risk of medicines-related problems. Whilst a health and social care team approach to supporting these patients is advocated, there is limited evidence regarding how pharmacists can best contribute. Objective To describe a new specialist pharmacy service (called the integrated care clinical pharmacist) in terms of how it works, what it achieves and its policy implications. Setting Patients’ own homes in Lambeth, London, UK. Method Community matrons identified patients who were experiencing medicines related problems. These were referred to the integrated care clinical pharmacist who undertook a full medication review and recorded activities, which were independently analysed anonymously. Main outcome measure Medicines-related problems and the associated interventions. Result 143 patients were referred to the service over a 15-month period. A total of 376 medicines-related problems were identified: 28 (7%) supply issues, 107 (29%) compliance issues, 241 (64%) clinical issues. A diverse range of interventions were instigated by the pharmacist, requiring the coordination of community pharmacists, primary and secondary health and social care professionals. Conclusion This project demonstrated that including an integrated care clinical pharmacy service as part of the health and social care team that visits frail, older people in their own homes has benefits. The service operated as part of a wider inter-professional community team. The service also supported current health policy priorities in medicines optimization by identifying and addressing a wide range of medicines related problems for this vulnerable patient group. We would like to thank the community matrons who referred patients to this new service and the patients who participated. Guy’s and St. Thomas’ Charity provided 2-year funding for the new service delivery approach, its evaluation and to explore the wider role of community pharmacy (Award Number: GT10040). The funding body did not contribute to the design of the evaluation and data collection, analysis or interpretation of data and did not contribute to the writing of the manuscript. LO, CL and SQ were involved in service design, delivery and data capture. Whilst listed as authors, they were not involved in the plan and execution of the evaluation or preparation of the final report, from which this manuscript was prepared. This was undertaken independently by SAF and FS. NHS Cumbria: STOPP/START toolkit supporting Medication Review. http://www.cumbria.nhs.uk/ProfessionalZone/MedicinesManagement/Guidelines/StopstartToolkit2011.pdf (2013). Accessed 19 Feb 2017. World Health Organisation: Adherence to long term therapies: evidence for action. 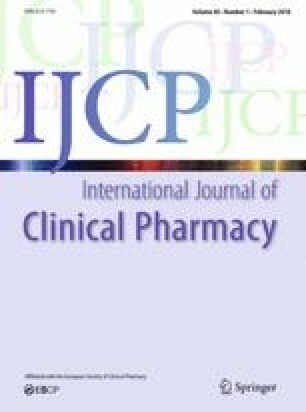 http://www.who.int/chp/knowledge/publications/adherence_full_report.pdf (2003). Accessed 22 Sept 2016. National Institute for Health and Care Excellence. Medicines optimization: the safe and effective use of medicines to enable the best possible outcomes. NICE guideline [NG5]. London, NICE Medicines and Prescribing Centre. https://www.nice.org.uk/guidance/ng5 (2015). Accessed 22 Sept 2016. Department of Health. Pharmacy in England: building on strengths, delivering the future. https://www.gov.uk/government/uploads/system/uploads/attachment_data/file/228858/7341.pdf (2008). Accessed 22 Sept 2016. NHS England: NHS five year forward view. https://www.england.nhs.uk/wp-content/uploads/2014/10/5yfv-web.pdf (2014). Accessed 22 Sept 2016. SLIC: Southwark and Lambeth integrated care model. http://slicare.org/ (2012). Accessed 21 Sept 2016.